Home > Analysis > Have hard measures attained their maximum utility? 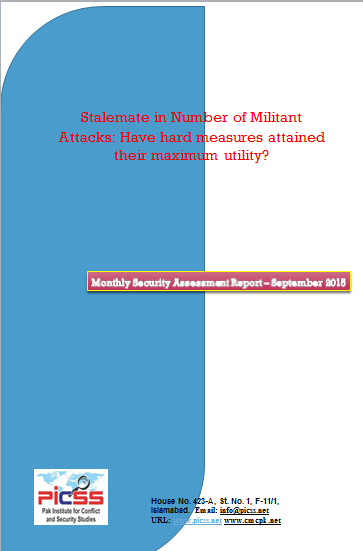 No significant change was observed in September 2015 in terms of overall number of militant attacks when compared with previous months. During September, 55 militant attacks were recorded against 53 in the month of August. The resultant deaths had witnessed a slight increase during September with figures of 125 deaths as compared to 110 in August. In these 55 militant attacks, 40 security forces personnel, 13 Razakars and 38 civilians lost their lives whereas 34 militants were also killed. Notable increase in militant activities was observed in KPK, while Baluchistan, FATA and Sindh witnessed reduction in violence during September. A significant militant activity was observed in KPK where militants managed to target a strategic location and this time it was PAF base in Badaber in Peshawar where 13 militants belonging to TTP targeted residential camp of PAF, who is engaged in airstrikes and targeting militants in military offensive launched in FATA. The attack caused deaths of 29 people including PAF and Army personnel while injuring the same number while all 13 attackers were killed. In terms of type of attacks, a total number of 12 IEDs were recorded with six in FATA, five in KPK, and one in Punjab. A total of 19 militants’ physical assaults were also noted throughout the country with three in Baluchistan, three in FATA, two in Sindh, seven in KPK, three in Punjab and one in Gilgit Baltistan. 17 incidents of target killing were reported across the country, suggesting an increase in such type of incidents during the month. Seven incidents of target killing were noticed in Baluchistan, three in KPK, six in Punjab and three in Sindh. Two rocket attacks were noticed in KPK while two grenade attacks were recorded in the FATA. Security forces operations against militants are maintaining the same pace. After attack on PAF camp, airstrikes were conducted on militants’ hideouts. 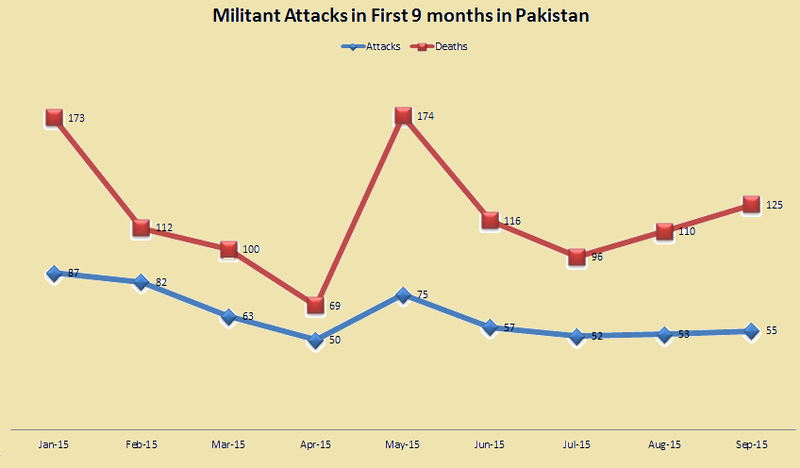 In September, 90 security forces actions against militants were recorded across the country. In these 90 security forces actions, at least 154 suspected militants were killed while fourteen civilians and six security forces personnel lost their lives. Security forces continued to focus on intelligence based operations and as many as 415 suspects were arrested across the country. In Baluchistan more number of people laid down their arms before authorities, which could help further improvement in security situation in the province in near future. Provincial and federal government issued code of conduct for collecting sacrificial hides restricting banned organizations to collect hides while seeking approval of the relevant authorizes was mandatory for all other organizations to collect hides. Some arrests were made across the country in connection with breaking code of conduct and collection of hides by the banned outfits. The measure has been adopted to curb the finances of the militants.